The daydreams of exploring the Caribbean or the coastal waterways of the Americas begin the moment the days turn chilly, and no winter daydream is more appealing than setting a course for an unknown tropical island across a glittering sea. Fulfillment of this wishful thinking however requires a certain proficiency in handling a boat. If the fact that your can’t tell a sheet from a gudgeon is all that’s holding you back, we have assembled a list of sailing schools that provide instruction as well as rental craft tailored to the experience of the individual. They can turn your daydream into a reality in much less time than you think. J-World was named best sailing school in the US by Practical Sailor Magazine and was attended by Chelsea Clinton in 1994. They have a new World-Wide Certification Program for beginners as well as experienced cruisers and are sanctioned for charter by the U.S. Sailing Association; (designated by Congress as the official governing body of sailing). Cruising courses are available at three different levels, beginners, intermediates and a live-aboard course for the more experienced sailors. 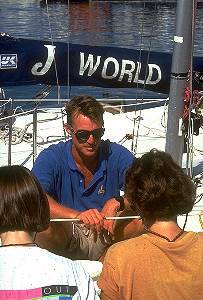 At J World students receive full days of sailing instruction. Designed as the basic building block, you will learn the fundamentals of how to prepare a boat for sailing and how to safely get away from, and return to, a dock for mooring. Under sail, you will practice tacking and jibing while gaining an understanding of how to control your boat by using your sails and rudder. The course also includes man overboard drills, coastal navigation, rules of the road basic spinnaker flying, heavy weather and distance sailing. For those interested in cruising, Sailing 2 takes the techniques mastered in sailing 1 and expands on each of them. The course concentrates on the skills charter companies need to see before accepting you as a customer. boat handling sail selection, man overboard, anchoring techniques, rules of the road, spinnaker work, cruise planning, coastal navigation, weather, and the uses of safety equipment are covered. Covers all aspects of handling an auxiliary powered sailboat that are necessary to charter safely and with confidence. It covers all vessel operations such as boat handling under power and sail, engine operation and trouble shooting, on-board systems including electronics, stoves, marine heads and holding tanks. Other subjects include coastal navigation, heavy weather and night sailing, emergency procedures, rules of the road and cruise planning. This program offers a short course that surveys key elements of sailing: terminology, steering and basic sail trim. If time permits, you may have a brief introduction to additional areas including safety and navigation. This course is ideal for the person who wants to discover more about sailing. They can round out their skills with a follow-up weekend. The foundation course for racers, Racing 1 is a a broad-based course that covers racing boat handling as well as tactics and strategy. On-board instruction includes an orientation to the spinnaker and its use around the race course, crew assignments, sail trim and shape, tacking, jibing, and starting drills, and short course racing with instructor’s review. Each Friday there is a regatta involving all students enrolled in racing courses. Racing 2 is an advanced course designed for the expert racer. The course covers advanced sail trim and boat handling, attacking and defending on the starting line, powering and depowering the sail plan, mark rounding, advanced spinnaker skills, tactics and strategy around the race course, practical application of the racing rules and elements of teamwork. The week’s training culminates on Friday with competition in the J-World Regatta. This is a racing oriented course covering advanced sail trim, crew organization, and spinnaker handling for racers. This course concentrates on boat handling alone. Despite the large number of charter boats available in the Caribbean, there are few charter operations that offer instruction from scratch. At The Bitter End Yacht Club on Virgin Gorda in the British Virgin Islands, the range of boats starts with a sailboard and goes up to a Freedom 30 (footer). 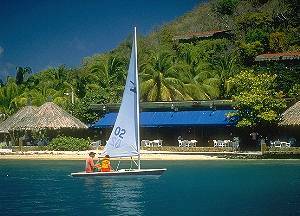 Most of the sailing is day-sailing with an instructor and accommodations are available in the villas resort, (if you choose not to sleep aboard the yacht). 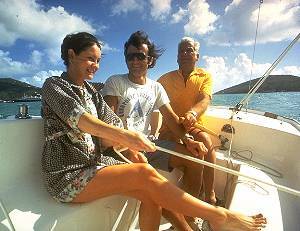 According to Conde Nast Magazine, this is one of the most comprehensive sailing programs in the Caribbean. An introductory classroom and dock side course gives you the language and fundamentals of sailing. This free course is provided in advance for all levels of instruction. Following the introductory class, beginners take a two day basic course for $100 aboard a 19-foot Rhodes 19 sloop with an instructor. At the end of the course, they are encouraged to take the boat out on their own to test their new skills. The next level, Performance Sailing ($100) puts the intermediate student on a 24 foot J-24 sloop for a half day session that includes learning how to sail an Olympic race course. Learning to Cruise ($100) teaches a proficient small boat sailor how to handle a 30-foot Freedom 30 on a blue water cruise to an outlying anchorage and back. The eight-day seven-night Admiral’s Package includes (free) the initial sailing class, meals, manager’s welcome party, airport transfers unlimited use of the resort’s fleet of more than 100 yachts and watercraft, complete water sports program, and daily island excursions. Remote and romantic, “Bitter End” -- the last Island outpost leading to the open waters of the Atlantic -- is a unique sea-and-sun resort that offers 100 ocean view villa and Commodore Club suites, eight live-aboard charter yachts, a hillside estate house conference center, white sand beaches and fine restaurants and lounges. The Santa Barbara Sailing Center is one of the largest accredited sailing schools in the nation and issues both ASA (American Sailing Association) and US SAILING student certification. 40 boats and a large staff of impressively qualified instructors prepare the graduate to sail anywhere in the world. Resort Course: $159, (second family member) $99 Designed for the novice, this course teaches sailing fundamentals, nautical terminology, rules of the road, points of sail, launching and landing. 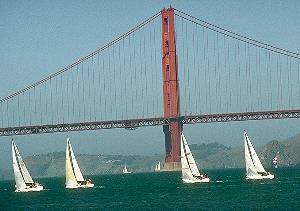 Taught on a 21-foot stable keelboat, the two day class offers 8 hours of instruction. No ASA certification. Instructional Charters: Personal live-aboard courses ranging from 4 to 12 days that teach Basic Keelboat to Bareboat Chartering. Prices vary depending on personalized learning schedule and level of certification desired. Basic Keelboat Sailing: ASA Certification 101, $259, 3 to 4 students per class, private, semiprivate and family rates available. Goal: competent to sail 20 foot sailboat in familiar waters. No prerequisite training. 16 hour course, 4 - four hour sessions, curriculum includes nautical terminology, maneuvering and docking, rules of the road, marine safety, sail shape, headsail changes, reefing, crew teamwork, docking undersail, power and safety procedures, principals of aero- and hydrodynamics of sailing. Course fee includes on the water instruction, manuals, returnable videos, log book, exam, certification plus three hours of free sailing with fellow students. Basic coastal Cruising: ASA Certification 103, $379, 3 to 4 students per class, private, semiprivate and family rates available. Goal: Qualified to rent 30 foot sailboat with inboard engine for local water day-sailing. Prerequisite: ASA Basic Keelboat Sailing 101. 2 &1/2 day course introduces the intermediate sailor to the cruising yacht and off-shore sailing. Curriculum includes mechanical and electrical systems, weather navigation, anchoring, reefing, heavy weather sailing, rules of the road, motoring skills, safety and emergency procedures, maneuvering under power and VHF radio procedures. The class begins with an evening three hour orientation aboard a 30 foot yacht plus two days of hands-on instruction and sailing. Offers all levels of ASA Certification - has a unique four-to-five week Mini-Transatlantic course from Florida to Bermuda for experienced sailors. The top course offered by the school is the “Transatlantic Crossing.” This is the ultimate achievement for any seasoned sailor: a Transatlantic crossing via Bermuda and the Azores Islands with landfall in Portugal or the return to Florida via Portugal, the Madeira Island, the canary Islands and the West Indies. Your next step will be to sail around the world in your own boat. 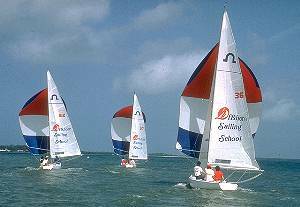 . .
Keelboat Certification System - Begin with a solid foundation of sailing instruction. US Sailing offers Certified Instructors, instructional materials developed by US Sailing, US Sailing Certification, US Sailing membership. Basic Keelboat -- To responsibly skipper and crew a simple day-sailing keelboat in familiar waters with light to moderate wind and sea conditions. Classes are taught aboard small 18-30 foot monohull sloops with or without an outboard motor and with tiller steering. Learn parts of the boat, sailing’s language nomenclature, knots, rigging leaving and returning to the dock or mooring, points of sail, safety procedures, sailing a course, mooring and securing a boat. Once certified you will be able to sail aboard your own rented keelboat in local waters or moderate weather conditions. Basic Cruising -- To responsibly skipper and crew an auxiliary powered cruising sailboat during daylight hours within sight of land in moderate wind and sea conditions. Courses are taught aboard sloops of moderate size (23-35 feet) with inboard or outboard auxiliary engines. You will advance your skill level in sail trim, reefing, crew coordination, chart reading, tides and currents, anchoring, rules of the road. Certification at this level will allow you to sail an auxiliary powered cruising sailboat on day-sailing excursions to explore the coastline and its harbors. Bareboat Cruising -- To responsibly skipper, crew or bareboat charter an inboard auxiliary powered cruising sailboat within sight of land in moderate to strong wind and sea conditions. Courses taught aboard 30-45 foot cruising sailboats with wheel steering and inboard diesel auxiliary power. Successfully complete this level and you’ll be ready to set sail on weekend cruises or bareboat charter at exotic tropical destinations. Coastal Navigation -- To properly use traditional navigation techniques and electronic navigation for near coastal passage making. This is the ground school for the advanced certifications where you will be venturing off-shore away from sight of land and out of protected waters. You will learn about piloting, ded (or dead) reckoning, set and drift, taking bearings and ranges, radar, Loran, GPS and other electronic aids to navigation. Your coastal navigation certification will provide you with the skills and confidence to navigate your way to any destination. Coastal Passage Making --To responsibly skipper and crew an inboard auxiliary powered cruising sailboat for coastal or off-shore passages in strong to heavy conditions, including zero visibility and nighttime in unfamiliar waters, out of sight of land. Celestial Navigation -- To navigate using celestial techniques and integrated celestial and traditional navigation. Even in today’s world of navigational miracles, like hand held GPS (Global Positioning System) experienced blue water sailors take comfort in their knowledge of traditional celestial navigation skills. 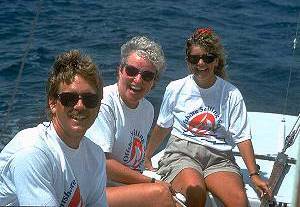 Sailmakers Caribbean Challenge: Nov. 4-12 1995. Tortola British, Virgin Islands. Our big boat racing course! In the world’s most beautiful sailing waters with the world’s finest instructional staff and to US Sailmakers as coaches, you race point to point through a sailor’s paradise. This program is a truly unique opportunity to learn to sail. 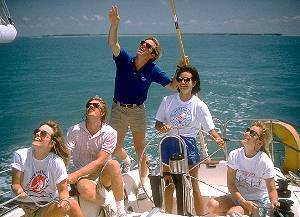 Florida Race Weeks occur in the Spring and Offshore holds a Women’s “You Can Sail” Escape. A Sail N’ Dive Course is a specialty and includes the complete Learn to Sail Course plus the PADI Dive certification in one week. Available on a week long schedule starting Sundays year round. A welcome party and orientation meeting is held on Sunday evening, Monday to Thursday includes two hour morning classroom sessions followed by half day sailing and half day diving instruction. Friday is instructional diving with final exam and Saturday is all day sailing without the instructor aboard. Other course offered include live aboard cruising and Fast Track to Cruising. To learn more about this smorgasbord of sailing opportunities and their locations including Captiva Island, Florida; Newport, Rhode Island; St Petersburg, Florida and Tortola British Virgin Islands, contact Offshore Sailing school or visit their Web site. A broad range of classes are offered for every level of proficiency. Basic Sailing weekend classes begin at $225 per person and 5 Cruising course aboard the Morgan 44 begins at $1,000 and is based on your grad or non-grad level and cabin location (dbl occupancy with private cabins available. Three basic courses lasting 2, 3, or 5 days, plus a special 4-part beginner’s course for area residents are available. Built upon a foundation of classroom interaction and practicing the skills developed during sailing sessions aboard the Rainbows. Class size above sailboats is limited to four students to ensure personal attention. Become a Sailor in One Weekend. More people have learned to sail by taking this famous weekend course than have taken all courses combined at any other sailing school. Each student receives 12 hours of instruction; 4 hours of lectures videos and classroom instruction and 8 hours of instruction aboard sailboats. For the student with some experience with sloop rigged boats this course is taught entirely in the cockpit of a Newport 30 cruising sailboat with auxiliary power. After hours of intensive on-board instruction, the student will not only have mastered the basic material covered by course 102, but also be fully prepared to handle the Newport 30 on our famous 5-day cruising course. For nearby residents this course is held for 3 hours each Saturday or Sunday for 4 consecutive weekends. Each session consists of a one-hour lecture followed by two hours of sailing instruction. Three-Day New Sailors Mini-Holiday. This Wednesday-through-Friday beginners course is designed to be a slightly longer introductory course without devoting a full week to learning the basics. It adds a valuable day of “free sailing” to the two day program of classroom and on-board instruction. Five-Day New Sailors Vacation Course This Monday through Friday course is the most complete and balanced of the Annapolis Sailing School’s basic courses. Well-rounded by even doses of topnotch sailing instruction and supervised practice under sail. By Wednesday students take complete control of the helm and begin a series of supervised practice sessions. Course 105 affords enough variety in wind and water over a five day period to give students a range of experience under various sailing conditions. Live-aboard cruising is a whole new world from which to learn to sail. It is the next logical step to chartering or owning your own boat. Among a multitude of other courses Annapolis offers “Kid Ship” a program designed for children who are learning to sail. Annapolis Sailing school offers a Celestial Navigation Home Study Course for $210. To borrow a video from the Annapolis sailing School library send $25 (refundable deposit per video) to the address listed below. Sailing taught to women by women. Womanship’s motto is “Nobody Yells” and for those who have crewed with overbearing skippers it carries great appeal. Offered are live-aboard learning cruises for all levels of proficiency. Cruises originate from Fort Meyers Florida, Biscayne Bay, Florida and Tortola British Virgin Islands. Sail on 30-45 foot yachts with rates ranging from $464 to $1,254. Next month Bareboat Charters, a list of charter services for the students who made the grade and are ready to strike out on their own.